How does one operationalise the new Continuing Professional Development regime as prescribed by the Financial Adviser Standards and Ethics Authority? Successful change management is difficult enough at the best of times. It’s particularly difficult when the new standard commences in the middle of the current standard. You might cynically explain the timing as a strategy to bolster the coffers of the big consulting firms and their ‘professionalism teams’ but the cause is less important than its impact. — David Bowie, "Space Oddity"
The new regime came into effect 1 January 2019. This change may not affect those licensees idling on the runway but most competently run licensees are mid CPD flight, having commenced their CPD year 1 July 2018. If you’re one of those licensees that implemented strategies, last year or earlier, to manage your regulatory obligations, what do yo do now? How do you keep your CPD plane in the air, accommodate the new CPD standards and satisfy your obligations so that you can safely touch-down on 30 June 2020? Helpfully FASEA has provided guidance on how you can deal with this challenge. As indicated by Part B of FPS004 Continuing Development Policy confirms, FASEA has provisioned for a transition period. This means that if your CPD year starts after 1 Jan 2019, you can pro-rata the hours for the period from 1 Jan 2019 to the commencement of your CPD year. These hours are then added to the licensee’s first full CPD year under the new regime. For example, if the CPD year commenced 1 July 2019, the requirement will be 60 hours which will need to be completed no later than 30 June 2020. Before we attempt to explain this by illustration, let’s revisit the new CPD requirement for both a relevant provider and a licensee. An adviser must undertake sufficient continuing professional training to maintain competence at a level appropriate for the professional services (including financial product advice) that they provide, or intends to provide, and keep up to date with developments relevant to their practice. produce those records to the licensee for the licensee to meet its compliance with the CPD Year requirements. A positive feature of the new CPD standard includes some provisioning for those tricky extended leave and part-time scenarios. For those of you maintaining the regime for your respective licensees, this will be music to your ears. The Corporations (Relevant Providers Continuing Professional Development Standard) Determination 2018, has provisioned for career breaks, which allows advisers to return from sabbaticals or maternity leave without additional requirements. Well, there are some qualifications. The leave period must be less than 2 years and, for a leave period of 2 years or more, you must undertake appropriate CPD to ensure you upskill with the latest regulatory and licensee requirements. 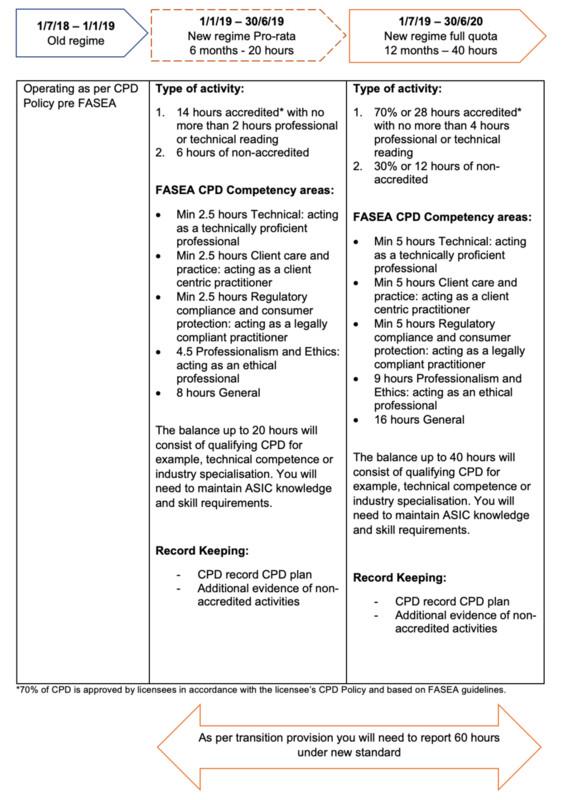 Furthermore, for your part-timers, there’s a pro-rata provision, where a relevant provider who is working part time, with prior written consent of the licensee, can complete 36 hours of CPD activity. For completeness, those new to the profession are not required to meet the continuing professional development standard. If you need assistance, we’re close by. There’s no need for “mayday, mayday” quite yet. Email us. As a licensee you will also be required to notify ASIC about the day your CPD year is to begin. Fortunately, we have a reprieve from notifying ASIC. As per s1546E (2) the requirement to lodge a notice about the day on which a financial services licensee’s CPD year is to begin only applies on and after 15 November 2019. Let’s get back to the challenge of accomodating the new regime while you’re already in mid CPD flight. You have no time for prevarication. The unwelcome reality is that, by 30 June 2020, you need to complete 60 hours of continuing professional development that satisfies the new standard. Sixty hours of mandated training by 30 June 2020. It doesn’t look any easier when it’s graphically represented, but the following table might best illustrate the requirements. You might ask yourself what should I do next? Create a continuous and up to date CPD record, that includes evidence of activity completed. There’s more than one way to meet these requirements; you can speak to your training providers or implement a reg-tech solution that more broadly benefits your business. What wound did ever heal but by degrees": FASEA, Professionalism and the future.